Home Opinions Columns Does freedom of expression give you freedom to offend? I refuse to see “The Interview.” The part of me that fantasizes over my wedding with James Franco was rather upset by this decision, but even more upset that Franco would fall into the same troubling trap as so many Americans today: bastardizing free expression. Let me be clear: Kim Jong Un is detestable, on an enormous scale no less. I am not contesting that. I am contesting the decision to make a movie in which we, the American people, openly plan to assassinate the North Korean leader. When the U.S. government confirmed that North Korea both hacked Sony and threatened violence against any theater that released the film, diplomatic tensions rose dramatically, as did the cry of nationalists whose freedom of expression would not be silenced by a country halfway around the world. If we wanted to make a movie about killing Kim Jong Un, we would do it, and no one could tell us otherwise. The essential problem with this is the lack of actual thought put into these aggressively offensive displays of free expression. We as a country feel that we can do whatever we want, and hide from the consequences behind a thin veil of all-American freedom of expression. If anyone told me that the producers of “The Interview” didn’t expect North Korea to take enormous, out-of-proportion offense to this movie, it would be a bold-faced lie. In the haze of free expression we refuse to see the predictable and unwanted consequences of our actions. I don’t condone the threat or use of violence in retaliation to political humor, but I also refuse to condone unnecessary and tactless political humor that is designed to elicit often-violent responses, whether the creators are ready to accept that or not. 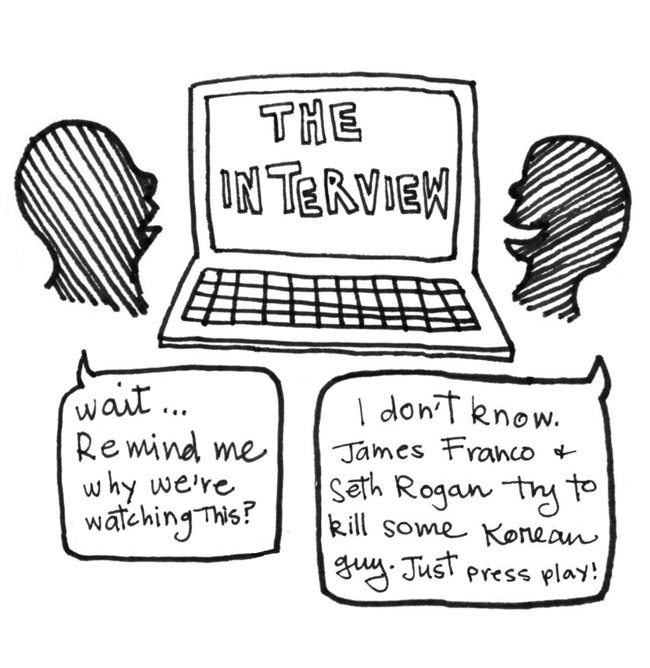 What’s worse, movies like The Interview are tailored to our generation, 20-somethings known for what others repeatedly refer to as our disrespectful attitudes. In reality, we are the driving force behind offensive productivity. The issue is not one of whether we have the right to say and do offensive things in the name of free expression; the issue is our inability to do so critically. We don’t evaluate the meaningfulness, or lack thereof, of certain forms of free expression. There is a line between meaningful and unnecessary political humor. These forms of free expression offer no political tact, no constructive political message. Yet we defend them, because this is America and we can do whatever we want. It’s not our fault that someone else can’t take a joke. The reality is that it is our fault. Freedom of expression is a tool, but it’s one we seem to have forgotten how to use. We have forgotten how to evaluate our actions, and instead choose to act horrendously and hide behind our freedom to do so. There are better ways to express our disdain for the Korean government than vulgar films, and I can only hope that William and Mary students can be a part of that kind of dialogue. Email Kaitlan Shaub at kcshaub@email.wm.edu.